46" Octagon Outdoor Tables with four, three or two attached seats. The top and seats are thermoplastic coated expanded # 9 gauge steel for all weather durability and have rolled seats and round corners for added safety and comfort. Powder-Coated 4" square pedestal base for added strength. 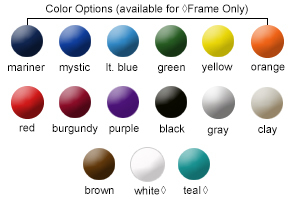 Top and seats available in the color options shown below in a lightly textured Polyethylene coating. 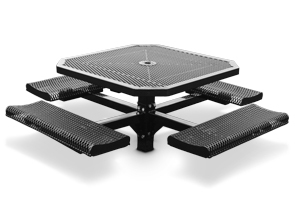 All wheelchair access octagon outdoor tables conform to latest ADA specifications.